Tasmania Police’s first ever woman Constable was Kate Evelyn Campbell, who was sworn in on 20 October 1917. Stationed in Hobart, Constable Campbell’s duties were focused largely on the welfare of women and children. She met the arrival of long distance trains and steamers to direct the arriving women and children to accommodation houses, patrolled public parks, visited factories that employed women, dealt with fortune telling, patrolled poorer areas of the city to see that children were properly attended to and assisted with the issue of truancy. Her uniform was described as a blue walking dress, with badge and number worn on her coat. She also carried a warrant card. Aged 32 at the time of her appointment, Constable Campbell was within the maximum age limit of 35 for women to be considered for appointment as Constables. Born Kate Evelyn Peter in Launceston on 4 November 1885, she had moved back to Tasmania sometime after 1913 after living in Orange, New South Wales, with her husband and sons. At the time she joined Tasmania Police she had one son, Colin A Campbell, aged 5. Her husband Colin Stewart Campbell and her infant son Robert J Campbell had both died in 1914. Her career with Tasmania Police was short and she left to take up a position as a clerk with WT Bell & Co in Launceston less than three months after she started. 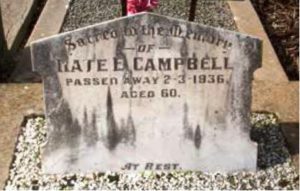 Ms Campbell died in St Arnaud in Victoria in 1936, with her age listed as 50. 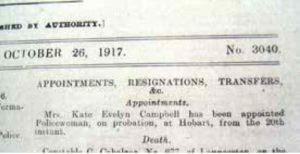 Above left: The Tasmania Police Gazette notice from October 1917 announces Kate Campbell’s appointment. Above right: Kate Campbell’s grave at St Albans, Victoria, before it was restored. This page -- https://www.police.tas.gov.au/about-us/100-years-women-policing-tasmania-police/first-women-tasmania-police/kate-evelyn-campbell/ -- was last published on January 17, 2018 by the Department of Police, Fire and Emergency Management.